Axel Hirsoux was born on September 26, 1982 in Courcelles, near Charleroi and living now in La Hestre, Henegouwen. He works in the field of education. His love of music was in his blood even as a child. During his early years he studied music theory for 5 years after which he learned to play the trumpet. 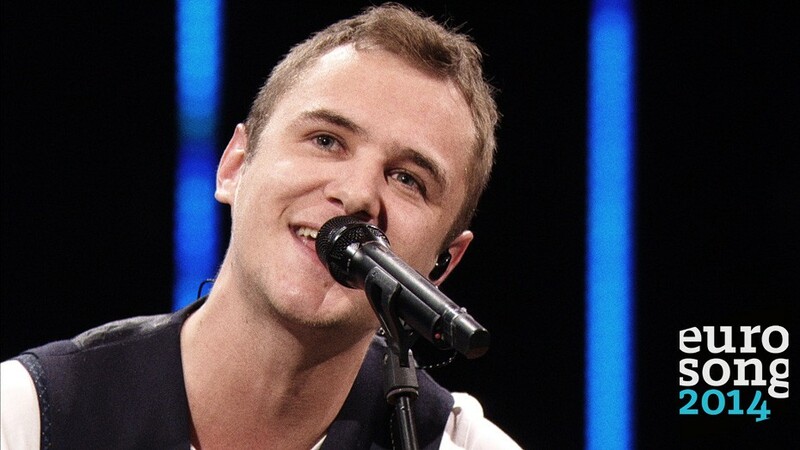 In 2001 he first took part in a singing contest. One year after he met his vocal coach Nell, who took his vocal performance to a higher level and even today he is still working with her. 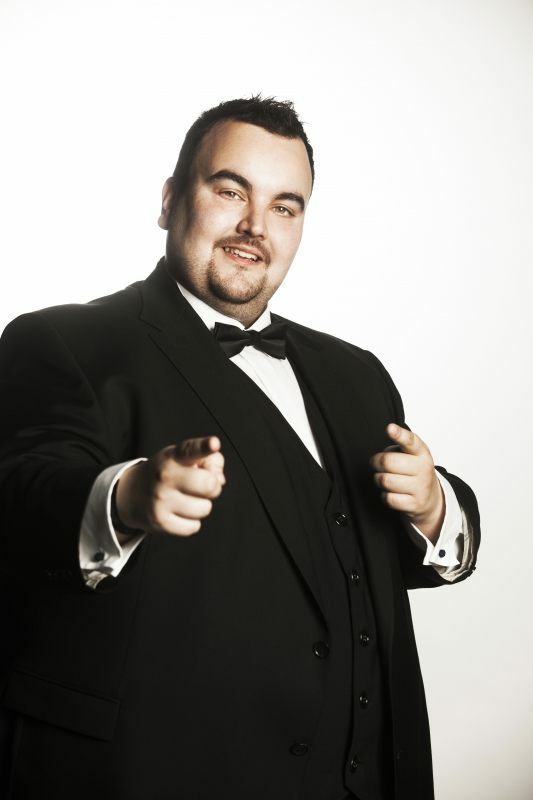 He tried his luck in the past with such singing competitions as the Concours International de la Chanson (2004, Second Prize). At the age of 23 he registered for the Star Academy in France where he just missed out on being selected. But Axel did not give up. In 2007, Axel has a privilege of meeting Helene Segara and performing with her "Vivo Per Lei" on the stage of the Palais des Beaux-Arts de Charleroi to an audience of 1500 people. In 2010, he also took part in Concert Tribute to Grégory Lemarchal. 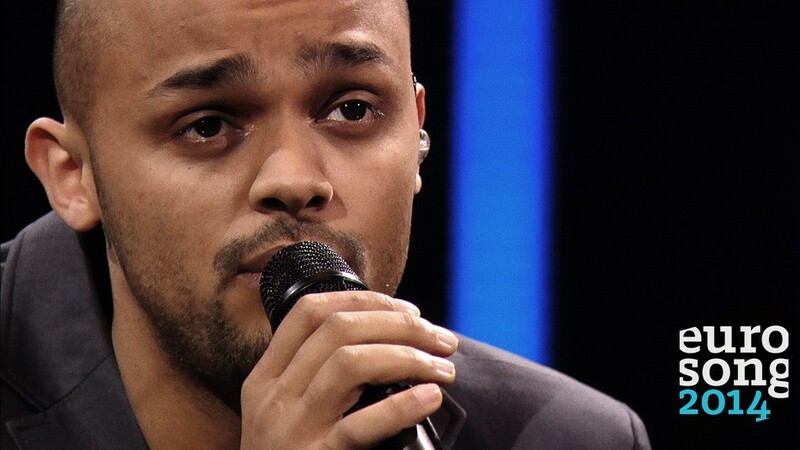 In 2013 he entered The Voice Belgique (mentor Natasha St-Pier), where he was relegated in the second round. He also played a number of roles in musicals in troupe "Espoir en chanteur", like Gringoire in the musical Notre Dame de Paris or Roméo & Juliette. You can watch more from Axel on his Youtube channel. 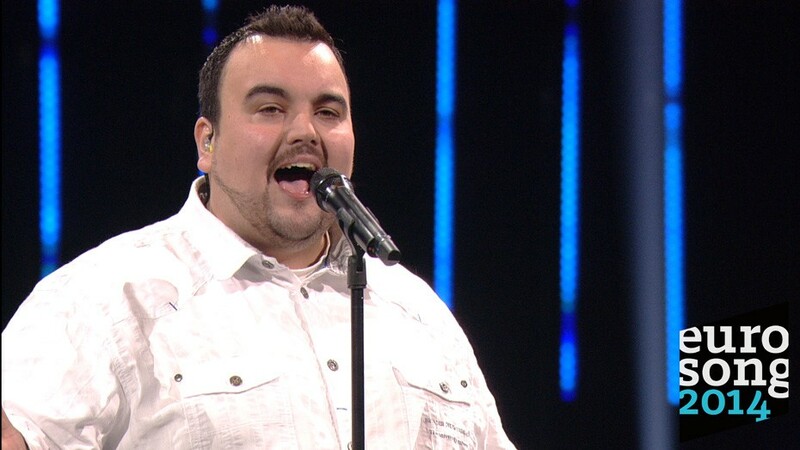 Eurovision fan, in 2011 he has released cover version of Tom Dice's Eurovision entry "Me and my Guitar" (it's co-writer Ashley Hicklin is also co-writer of Axel's Eurovision entry "Mother"), and in 2013 his version of Loreen's "Euphoria (his favourite Eurovision entry of all times). Last year, Alex was part of professional Belgian jury that has been voting at Eurovision Song Contest 2013, with his favourites being Denmark and Ukraine. 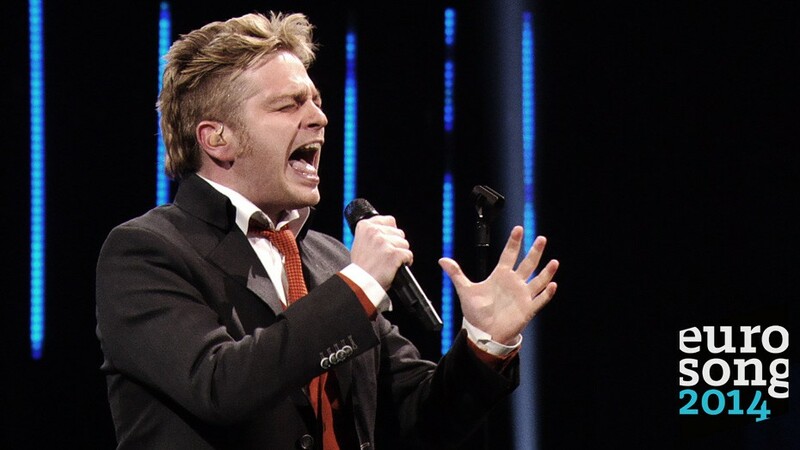 Axel was the only Walloon participant in this year edition of Eurosong, since there is a rotation system between VRT and RTBF for Belgian participation in Eurovision. At the auditions he performed "Tu Te Reconnaîtras" by Anne Marie David and has received very positive comments from the original singer herself. His performance of "Mother" in the semifinal have scored record points and was highly praised by all jury members including Ruslana. "If you want to win this year - go for it," she said. On the stage Axel us joined by dancer Isabelle Beernaert, who also was choreographer for So you think you can dance. The song was composed by Rafael Artesero and Ashley Hicklin and produced by David Poltrock. Entries of Spanish composer Rafael Artesero Herrero have represented Andorra in 2005 and 2006 and Spain in 2011. Single on "Mother" was released on March 10, and has so far charted at #19 at Flemish Ultratop 50. Axel sings his song with his whole heart and dedicates it to all the mothers of the world, and by extension, to all women. It is probably not a number you would expect to hear at the Eurovision Song Contest, but in Axel's view the universal message of Mother is in fact very suitable for the festival. For Axel participating in the Eurovision Song Contest is a dream come true. He likes to think back to all the years he sat and watched the Eurovision Song Contest and told himself that one day he would participate in it. He regards it as a very important event on an artistic level, and hopefully it will prove to be a good start to a professional musical career. 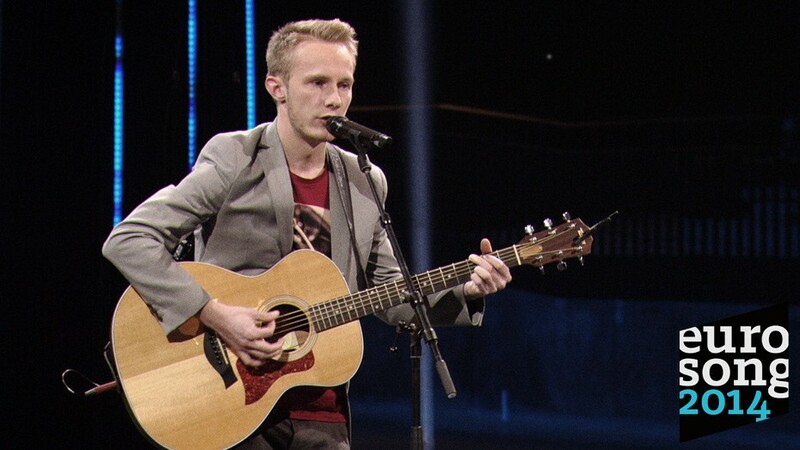 In what is probably the last text interview of this season, we have met for a short chat with the representative of Belgium at the Eurovision Song Contest 2014 Axel Hirsoux, who will be performing song "Mother" at the contest. "I'm very proud to represent my country. Since I was a kid I've been watching the Eurovision song contest with my family so it’s like a dream come true. I also hope it can be the start of my own professional music career"
"In Belgium we had a new concept. 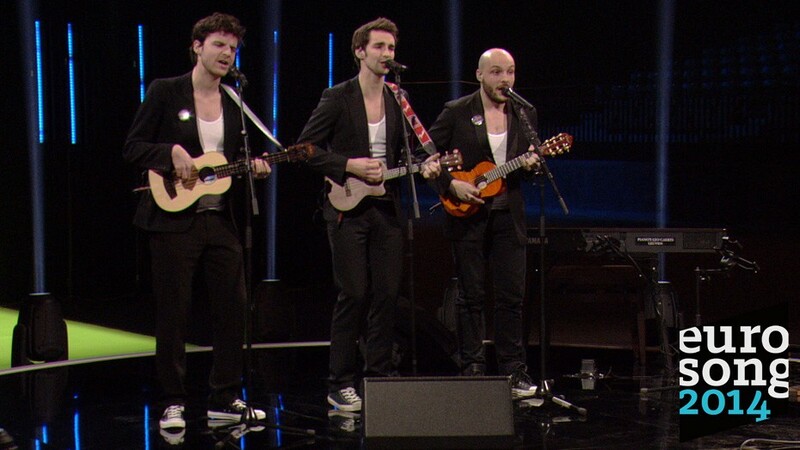 Four music experts selected songs for the participants in Eurosong 2014. I got "Mother". I think they made a very good choice. From the start I really felt it was meant to be my song. Together with producer David Poltrock I could really make it my own", explains Axel the choice of his entry. One of the jury members at the national final Eurosong was ESC 2004 winner from Ukraine Ruslana, and of course we've asked if she gave Axel any special advices? "I love Ruslana. She knows what she’s talking about. She told me to be true to myself. And that there’s always first the voice"
Speaking about his performance in Copenhagen, Axel says there won't be many changes there, may be only some details will be altered. He will be joined on the stage by Isabelle Beernaert, who is a very well known choreographer in Belgium and the Netherlands - it is 7 years since she performed herself for the last time on stage. 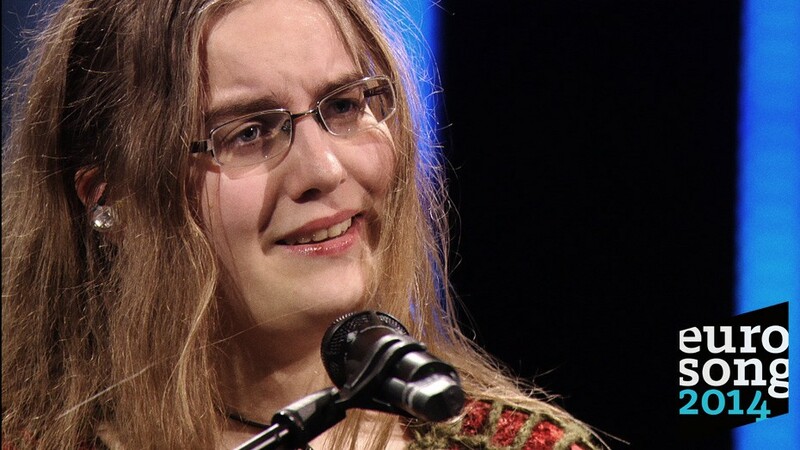 "When we were talking about the act, I dared to ask if she could join me on stage. She surprised herself by saying Yes. We have a really good connection. I’m very thrilled she will be at my side in this magic journey", says Axel. "My goal is obtaining a ticket for the final. That would be great. 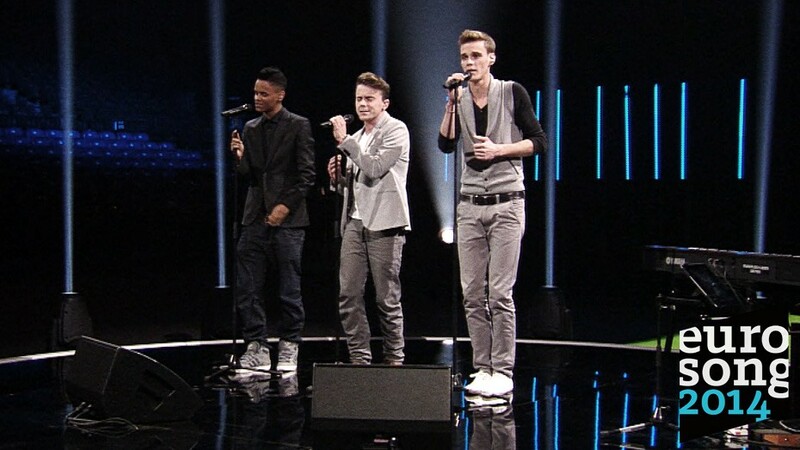 And after that, everything can happen"
As part of promotion, Axel has taken part in Eurovision In Concert in Amsterdam. "I had a very good time there, but unfortunately, because of a very busy schedule it wasn’t possible to do more events, like the ones in London and Moscow for example. For now, my focus is on Copenhagen". The week prior to Copenhagen will also see the premiere of the official music video for Mother, which has been recorded last week, in a small but beautiful Vaudeville Theatre in Brussels, together with 200 mothers. And what comes after Eurovision? "If everything goes well, there will be a new single, followed by my first album later this year", says Axel and we will be definitely looking forward that, as well as meeting him soon in Copenhagen. You can read the full text of the interview on our Facebook page. 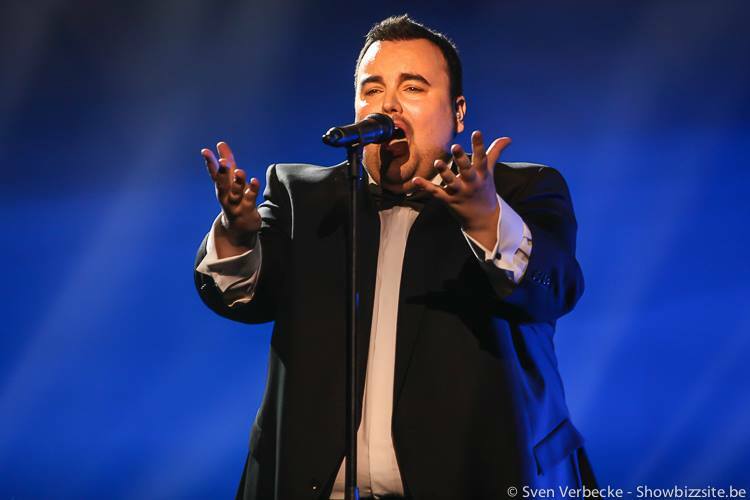 ESCKAZ has recorded video interview with Axel Hirsoux at Eurovision In Concert in Amsterdam. Belgian representative has confirmed that there will be no changes in the stage presentation for Eurovision. "If I will get to the final and get to the top 10, there will be a big party for us", says Axel. We've also asked him about Ruslana, who was supporting him all the way along the national preselection. "Ruslana is a very beautiful woman, she is a very special for me now. She said "Keep cool, enjoy, sing for all people in the world, since with your heart". Belgian entry for Eurovision Song Contest 2014 will be chosen via "Eurosong 2014" show organized by Flemish broadcaster VRT. VRT returns to a multi-artist final for the first time since 2008. 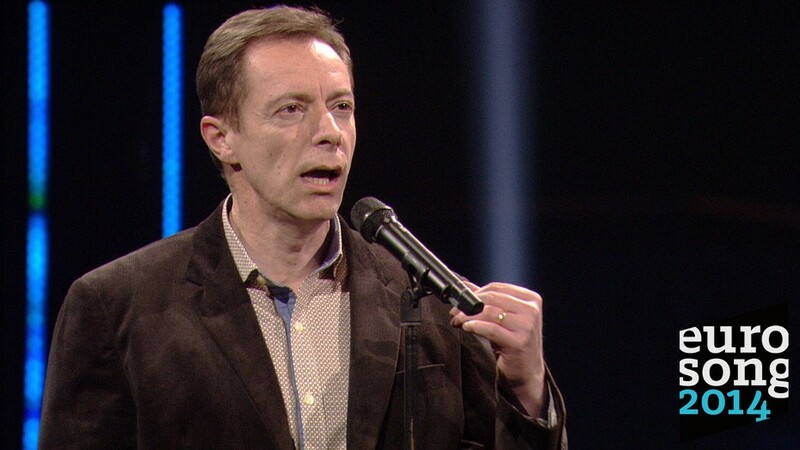 "Eurosong 2014" will include 7 episodes. 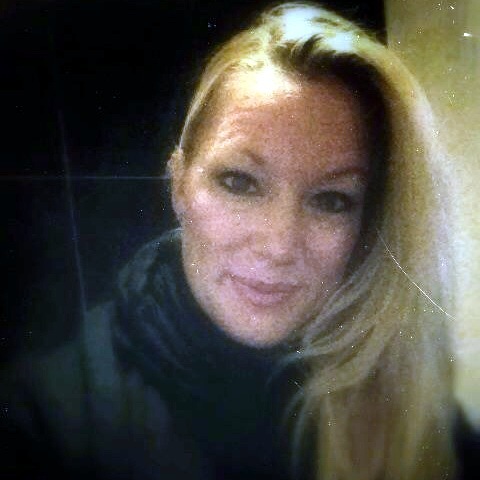 Shows will be hosted by Eva Daeleman and Peter Van de Veire. The submission period run separately for interested artists (October 1-14, submitting video of performance of Eurovision cover version) and for interested songwriters (October 1-28). Casting of artists for the shows took place on December 3, 2013 at the Sportpaleis in Antwerp and was attended by 30 potential participants chosen from submitted entries. Among them are: Petra (Eurosong 1993,1999,2006), Nelson Morais (Eurosong 2008), Udo (French selection 2011), Veronica Codesal and Soetkin Collier (ex Urban Trad), Axeela (ex Lizzaxy, The Voice 2012), Viola Furleo (Eurosong 1999-2002) and Kristof Van Den Bergh, Silvy De Bie (Sylver), 2Fabiola (with Patrick Claesen, Eurosong 1993), Andrei Lugovski (Idool 2007), Maureen (Idol 2011), Manuel Palomo (Idool 2011), Yass (The Voice 2012), Eva Jacobs (The Voice 2012), White Bird (The Voice 2013), Jonas Cole (Idool 2011), The Fuckuleles, 3M8s, Bandits, Jessy van de MacKenzie, The Exclusive Strings. The band "Day One" has appeared at the castings masked. "They are four famous people, who come from different sides of show-biz. 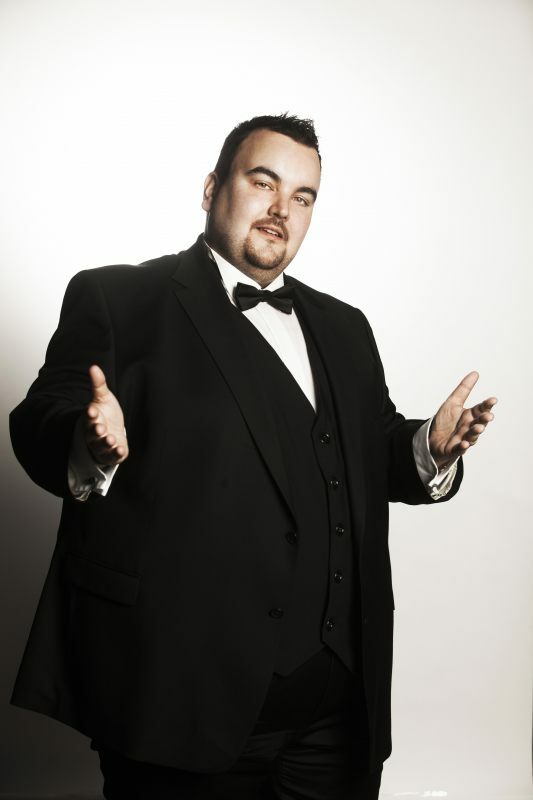 To prevent people judging them by names, they have decided to take part in the show incognito", explained band manager Peter Muls. However, newspaper Het Laatste Nieuws has reported, that one of the members is 2006 Eurovision entrant Kate Ryan. According to paper she is accompanied by Babl and Michael Schack, keyboardist and drummer of Netsky. 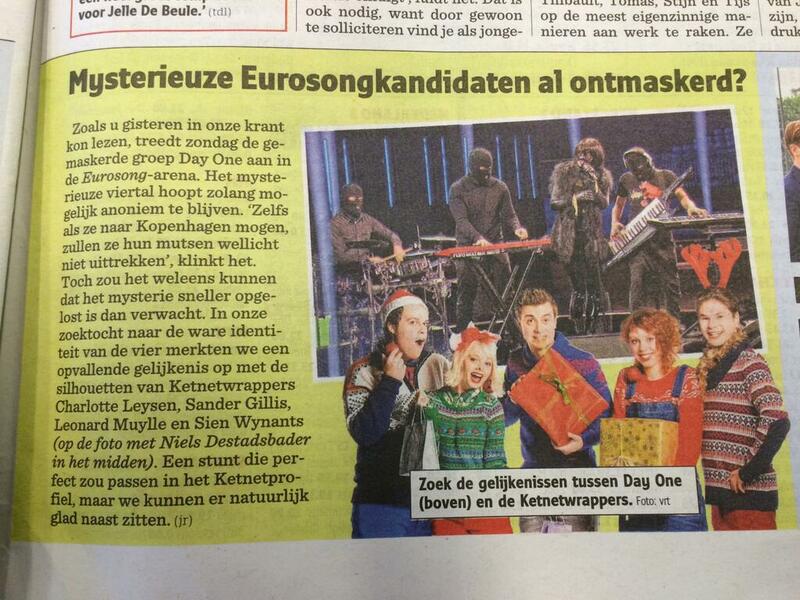 The Het Nieuwsblad newspaper has earlier reported that "Day One" is made of Ketnetwrappers Charlotte Leysen, Sander Gillis, Leonard Muylle and Sien Wynants. The discussions continued after Call Back round. Kate Ryan herself denied the story, saying "It can't be me, since I was in Russia that time". Yet, Het Laatste News insisted that Day One are Kate Ryan backed by Netsky band. Several artists meeting the Day One singer also reacted saying it is for sure Kate Ryan. However, on February 20 Eurosong.be has reported that Day One singer can be unknown Katia Vanhemelryck, who is girlfriend of band manager Peter Muls. The story will continue developing, as Kate Ryan is due to perform as special guest in Eurosong final. Starting from the Call Back stage perfomers sing original, potential Eurovision entries. All songs of semifinalists, as well as of Call Back loosers will be released on the official compilation of the preselection. Second Chance (aka Call Back) round was broadcasted on February 16 and gathered 1.264.901 viewers. 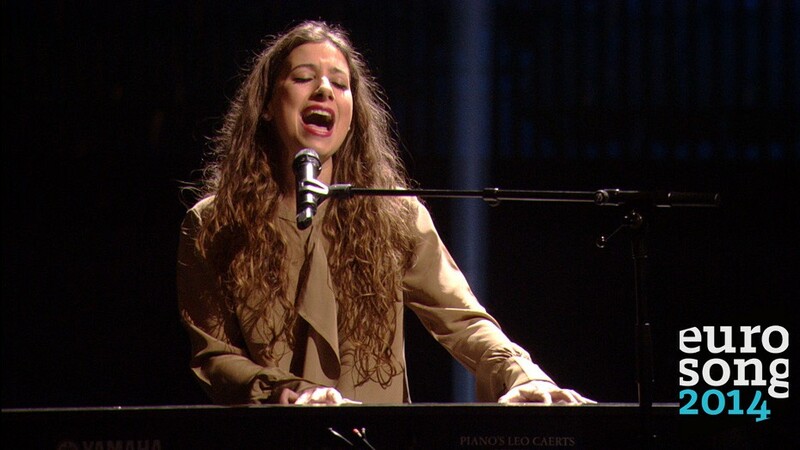 4 out of 8 competing artists were chosen for the semifinals by televoting and jury vote. Ruslana has joined the jury as 4th member, and televoters were able to cast their votes by SMS and online. Since February 17, non-qualified entries: Jessy - "Beautiful" (Jessy De Smet, Tim Burkes, Yves Gaillard); Mr. Jones - "Still Believe" (Tom Dice, Patrick Hamilton, Vincent Pierins); Joyce - "I think I" (Joyce Lemmens, Tom Balis, Wouter Vander Veken); Whitebird - "Fire & Ice" (Tom Helsen, Yannick Fonderie) are available on iTunes. Three semifinal rounds of 4 entries each have taken place on February 23, March 2 and 9. Viewing rates: 1st semi: 1.272.961; 2nd semi: 1.262.317; 3rd semi: 1.206.126. Top 2 from each semifinal on the decision of jury and public will proceed to the final. The final of Eurosong 2014 will be aired on March 16 from the Het Sportpaleis in Antwerp and will feature 6 competing artists. 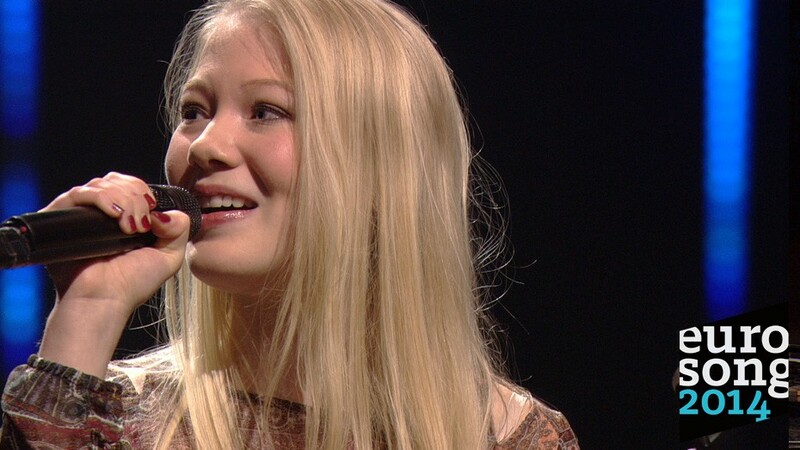 Winner will be chosen by a European Jury panel and televoting. International juries for the final will come from Azerbaijan, Denmark, Ireland, Macedonia, Netherlands, Spain and Belarus. In total, the European jury will have 280 points. Each percent of televoting will be equal to 2.8 points. Аксел Ирсу родился 26 сентября 1982 года в Курселе, провинция Шарлеруа, и живет в Ла Эстре, провинция Эно. Он работает в области образования. Любовь к музыке была в крови Акселя даже в детские годы. В раннем возрасте он изучал в течении 5 лет музыкальную теорию, а затем стал учиться играть на трубе. В 2001 году он впервые принял участие в песенном конкурсе. Год спустя он познакомился со своим педагогом по вокалу Нелл, которая поднял его голос на более высокий уровень, и он по сей день работает с ней. В прошлом он пробовал себя на таких музыкальных конкурсах как Concours International de la Chanson (2004, второй приз). В возрасте 23х лет он подал заявку на участие в Star Academy во Франции, где однако не был выбран в состав участников шоу. Но Аксел не сдался. В 2007 году Аксел познакомился с Элен Сегара и исполнил с ней песню "Vivo Per Lei" на сцене Дворца искусств Шарлеруа для аудитории в 1500 зрителей. В 2010 году он принял участие в концерте памяти Грегори Лемаршала. В 2013 году он принял участие в бельгийской версии шоу Голос, попав в команду Наташи Сен-Пьер и вылетев на стадии дуэдей. Также он играл в ряде мюзиклов в труппе "Espoir en chanteur", например в роли Гренгуара в мюзикле Notre Dame de Paris или в Roméo & Juliette. Вы можете посмотреть различные видео выступлений Акселя на его канале в Youtube. Давний поклонник конкурса Евровидение, в 2011 году он выпустил кавер версию песни Тома Дайса "Me and my Guitar" (ее соавтор Эшли Хиклин теперь является также соавтором песни Акселя "Mother"), а в 2013 году - свою версию песни Лорен "Euphoria (его любимой песни Евровидения всех времен). В прошлом году Аксел входил в профессиональное жюри Бельгии, которое оценивало конкурсантов Евровидения 2013, и отдал свои высшие баллы Дании и Украине. В этом году Аксел был единственным представителем из Валонии на национальном отборе Eurosong, поскольку обычно между телеканалами Валонии RTBF и Фландрии VRT существует система ротации - и в этом году отбор проводит VRT. На прослушиваниях он исполнил песню "Tu Te Reconnaîtras" Анны Мари Давид, и получил положительные отзывы от самой певицы. Его выступление с песней "Mother" на полуфинале отбора получило рекордно высокие оценки и восхищение всех членов жюри, включая украинскую певицу Руслану: "Если вы хотите победить в этом году - выбирайте ее", сказала Руслана. На сцене вместе с Акселем выступает танцовщица Изабель Беернерт, которая также была хореографом шоу So you think you can dance. Авторами песни "Mother" являются Рафаэль Артесеро и Эшли Хиклин, продюсер Дэвид Полтрок. Песни Рафаэля Артесеро представляли Андорру на Евровидении 2005 и 2006 и Испанию в 2011. Сингл на песню "Mother" был выпущен 10 марта, и на данный момент его самой высокой строчкой во фламанском Ultratop 50 была 19я. Аксел поет свою песню от всего сердца и посвящает ее всем матерям, и в более широком понимании, всем женщинам. Вероятно это не песня, которую вы ожидаете услышать на конкурсе Евровидение, но в понимании Акселя, универсальный месседж песни очень подходит для фестиваля. Для него участие в Евровидении, это сбывшаяся мечта. Он любит вспоминать все годы, когда он смотрел конкурс по телевизору и говорил себе, что однажды сам примет в нем участие. Он рассматривает его как очень важное мероприятие на художественном уровне, и надеется, что оно станет хорошим стартом для его профессиональной музыкальной карьеры. Скорее всего в нашем последнем текстовом интервью этого сезона, мы коротко пообщались с представителем Бельгии на Евровидение 2014 Акселем Ирсу, который исполнит на конкурсе композицию "Mother". "Я очень горд тем, что удостоился чести представлять свою страну. С раннего детства я следил за конкурсом Евровидение вместе со своей семьей, потому для меня это - воплощение моей мечты. Я также надеюсь, что это станет стартом моей музыкальной карьеры"
"В этом году на Бельгийском отборе была новая концепция. Песни его участникам подбирали четыре музыкальных эксперта, и мне досталась "Mother". Мне кажется, что они сделали весьма хороший выбор. С самого начала я почувствовал, что эта песня как будто-бы создана для меня. И вместе с продюсером Давидом Полтроком я смог сделать ее по-настоящему своей", объясняет Аксель выбор своей песни. Одним из членов жюри национального отбора Eurosong была победительница конкурса 2004 года, певица из Украины Руслана. Дала ли она Акселю какие-то советы? "Я очень люблю Руслану. Она знает о чем говорит. Мне она посоветовала оставаться верным самому себе. И что всегда на первом месте должен быть голос"
Рассказывая о своем предстоящем выступлении в Копенгагене, Аксель отмечает, что в нем будет не так много изменений, может быть будут доработаны только мелкие детали. Вместе с ним на сцене выступает Изабель Беернерт, очень известная хореограф из Бельгии и Нидерландов - но уже прошло 7 лет спустя ее последнего собственного выступления на сцене. "Когда мы обсуждали номер, я набрался смелости предложить ей самой присоединиться ко мне на сцене. И удивительно, но она согласилась. Мы очень хорошо взаимодействуем с ней. Я очень польщен тому, что она будет находиться рядом в этом волшебном путешествии", говорит Аксель. "Моя задача, прежде всего - получение билета в финал. Это будет просто великолепно. А там уже может случиться все, что угодно"
В рамках промоушена Аксель посетил вечеринку Eurovision in Concert в Амстердаме. "Я очень хорошо провел там время, но, к сожалению, из-за нашего напряженного графика, мы не смогли побывать на других подобных мероприятиях, например в Лондоне или в Москве. В настоящее время я фокусируюсь на подготовке к Копенгагену". На неделе, оставшейся до Копенгагена, пройдет премьера видеоклипа на песню "Mother", снятого на прошлой неделе в маленьком, но очень красивом театре Vaudeville Theatre в Брюсселе. В съемке были задействованы 200 матерей всех возрастов. Что ждет его после Евровидения? "Если все будет в порядке, то выйдет мой новый сингл, а ближе к концу года - альбом", говорит Аксель и мы с нетерпением будем ждать этого, как и возможности встретиться с ним в Копенгагене. С полным текстом интервью (на английском) вы можете познакомиться на нашей странице в Facebook. ESCKAZ записал видео интервью с Акселем Ирсу во время Eurovision In Concert в Амстердаме. Представитель Бельгии сообщил нам, что в его номере для Евровидения не планируется вносить каких-либо изменений. "Если я выйду в финал и смогу попасть там в топ 10, это будет большим праздником для всех нас", сказал Аксел. Конечно же, мы спросили его про Руслану, которая поддерживала его на всем протяжении национального отбора. "Руслана - это очень красивая женщина, она сыграла большую роль для меня. Она учила меня: "Будь спокоее, получай удовольствие, пой для всех людей мира, пой от всего своего сердца". Представитель Бельгии на конкурсе Евровидение 2014 будет выбран в рамках телешоу "Eurosong 2014", которое организует фламандский вещатель VRT. Он впервые возвращается к масштабному телевизионному отбору после 2008 года. "Eurosong 2014" будет состоять из 7 эпизодов. Ведущими шоу выступят Ева Далеман и Петер Ван де Вейре. Прием заявок проходил отдельно для заинтересованных артистов (1-14 октября, принимались видеозаписи исполнений кавер версий песен Евровидения) и заинтересованных авторов песен (1-28 октября). Кастинги артистов к шоу прошли 3го декабря 2013 года во Дворце Спорта Антверпена, и на них были приглашены 30 потенциальных кандидатов, выбранных из числа полученных заявок. Среди них: Petra (Eurosong 1993,1999,2006), Nelson Morais (Eurosong 2008), Udo (французский отбор 2011), Veronica Codesal и Soetkin Collier (ex Urban Trad), Axeela (ex Lizzaxy, The Voice 2012), Viola Furleo (Eurosong 1999-2002) и Kristof Van Den Bergh, Silvy De Bie (Sylver), 2Fabiola (с Patrick Claesen, Eurosong 1993), Andrei Lugovski (Idool 2007), Maureen (Idol 2011), Manuel Palomo (Idool 2011), Yass (The Voice 2012), Eva Jacobs (The Voice 2012), White Bird (The Voice 2013), Jonas Cole (Idool 2011), The Fuckuleles, 3M8s, Bandits, Jessy van de MacKenzie, The Exclusive Strings. Группа "Day One" выступила на кастинге в масках. "Это четыре известных человека, которые заняты в различных сферах шоу-бизнеса. Для того, чтобы зрители не оценивали их по именам, а не исполнению, они решили принять участие в шоу инкогнито", объяснил продюсер группы Петер Мулс. Однако, согласно газете Het Laastse Nieuws, в состав группы вошла представительница Бельгии на Евровидении 2006 Кейт Райан. По сообщению газеты, вместе с ней выступают Бабл и Михаель Шак, клавишник и барабанщик группы Netsky. Другая газета Het Nieuwsblad ранее сообщала о том, что в составе "Day One" выступают Ketnetwrappers Charlotte Leysen, Sander Gillis, Leonard Muylle и Sien Wynants. Дискуссии продолжились после Call Back раунда. Сама Кейт Райан опровергла эту информацию, заявив: "Это не могла быть я, поскольку я была в это время в России". Однако, газета Het Laatste News продолжила уверять, что Day One - это Кейт Райан и группа Netsky. Ряд артистов, вживую встречавшихся на отборе с Day One также высказали уверенность в том, что это именно Кейт Райан. Однако, 20 февраля eurosong.be сообщило, что солисткой Day One может быть неизвестная Катя Ванхемельрик, подруга менеджера группы Петера Мулса. История будет продолжена, а Кейт Райан должна выступить в качестве специальной гостьи на финале Eurosong. Начиная с эфира Call Back исполнители выступают с оригинальными песнями, назначенными ими отборочным жюри. Все песни полуфиналистов и проигравших участников Call Back войдут в официальный сборник отбора. Раунд Второй шанс (также именуемый Call Back) вышел в эфир 16го февраля и за ним следило 1.264.901 зрителей. 4 из 8 участвующих артистов были выбраны для полуфиналов совместным решением телезрителей и жюри. Руслана присоединилась к жюри в качестве 4го члена, а телезрители смогли проголосовать как посредством СМС, так и онлайн. C 17го февраля конкурсные песни невышедших в полуфинал исполнителей: Jessy - "Beautiful" (Jessy De Smet, Tim Burkes, Yves Gaillard); Mr. Jones - "Still Believe" (Tom Dice, Patrick Hamilton, Vincent Pierins); Joyce - "I think I" (Joyce Lemmens, Tom Balis, Wouter Vander Veken); Whitebird - "Fire & Ice" (Tom Helsen, Yannick Fonderie) доступны на iTunes. Три полуфинала из 4х песен каждый выйдут в эфир 23 февраля, 2 и 9 марта. Рейтинги эфиров: 1й полуфинал: 1.272.961; 2й полуфинал: 1.262.317; 3й полуфинал: 1.206.126. Двое лучших из каждого полуфинала по совместному решению зрителей и жюри выйдут в финал шоу. Финал Eurosong 2014 будет транслироваться в прямом эфире 16го марта из Дворца Спорта в Антверпене и в нем примут участие 6 исполнителей. Победитель будет выбран совместным решением Европейского жюри и телезрителей. Международные жюри финала будут из Азербайджана, Дании, Ирландии, Македонии, Нидерландов, Испании и Беларуси. Всего у Европейских жюри будет 280 баллов. Каждый процент в телеголосовании будет приравнен к 2.8 балла. Я слаб, а ты ярка.